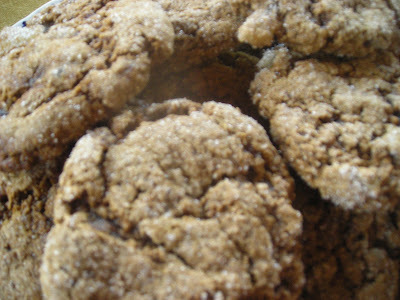 I love ginger cookies at any time of the year although to me they are more winter cookies. So good with a cup of tea. However, after watching Ina Garten make them on her television show, I decided that with the rainy week, ginger cookies would be a good nosh with a cup of warming tea on a rainy afternoon. 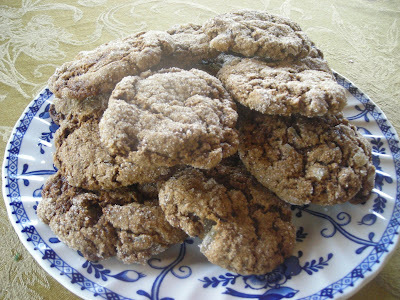 The cookies are easy to make and the ingredients are usually found in the larder -- even the molasses. Kept there especially to make ginger cookies! The recipe includes candied ginger and it is a nice taste surprise to bite into that candied ginger. But the best part of this ginger cookie (or any ginger cookie, actually) is the crunchy sugar crust! 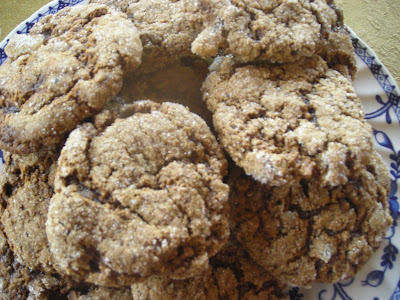 Ina calls them the "Ultimate Ginger Cookie" and they are! In a large bowl, sift together the flour, baking soda, cinnamon, cloves, nutmeg, ginger and salt and then combine the mixture with your hands. In the bowl of an electric mixer fitted iwth the paddle attachment, beat the brown sugar, oil and molasses on medium speed for 5 minutes. Turn the mixer to low speed, add the egg, and beat for 1 minute. Scrape the bowl with a rubber spatula and beat for 1 more minute. With the mixer still on low, slowly add the dry ingredients to the bowl and mix on medium speed for 2 minutes. Add the crystallized ginger and mix until combined. Scoop the dough with 2 spoons or a small ice cream scoop (I prefer the scoop). With yoru hands, roll each cookie into a 1 3/4 inch ball and then flatten them lightly with your fingers. Press both sides of each cookie in granulated sugar and place them on the sheet pans. Bake for exactly 13 minutes. The cookies will be crackled on the top and soft inside. Let the cookies cool on the sheets for 1 to 2 minutes, then transfer to wire racks to cool completely. Thanks again for what looks like a tantalizing recipe! We are still having some chilly days so i can imagine dunking those cookies in a nice cup of tea. I too am a fan of Ina. I have her most recent cookbook, Barefoot in Paris. She really has some personal anecdotes that are so interesting. You would like it. Yum, Martha! Ginger cookies are one of my favorite things! Oh my! Can't wait to try those cookies. I can almost smell them from here! 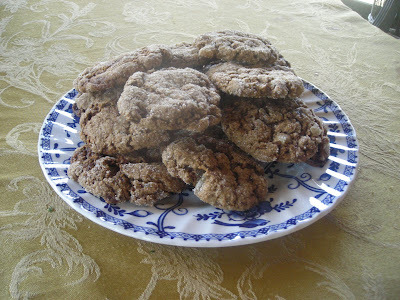 I love homemade cookies, always my number one choice...when I'm in a fix, I buy Carr's (I believe) Ginger Cremes. They are very English and go good with a spot o'tea! These always make me think of my German father in law and smile. These look beautiful. I didn't realize Ina Garten had a recipe for ginger cookies. I'll have to give these a try. Martha these look fabulous. I haven't baked this recipe yet but will now. I can taste them as I am enjoying your pics. Ina Garten is my favorite. These look scrumptious! I'll have to try them. Nancy -- I, too, like Carr's Ginger Creams -- but they are hard to find on my part of the prairie! I love ginger cookies with crystallized ginger, and these look wonderful. Ina has the best recipes!